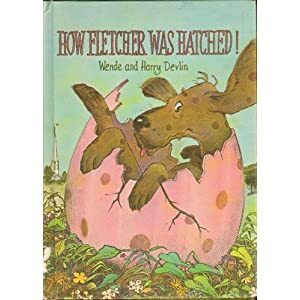 _How Fletcher Was Hatched_ is the story of a dog whose friends, an otter and a beaver, find a way to make him hatch to regain the love and attention of his owner, Alexandra, who lately has a thing for hatching cute and fluffy chicks that go “peep”! First thing I did was find someone selling a copy of it. It has some mustiness, or mildew in it somewhere, so I’ve got to keep it in a ziplock bag (anyone know about book cleaning? ), which is a bummer, but I’m just so glad to have it anyway! Then today I chose a page. Something that would sum up the story and be an emotional point to show off my ability to portray emotion. Here’s the page I chose and the sketch I did to update it. 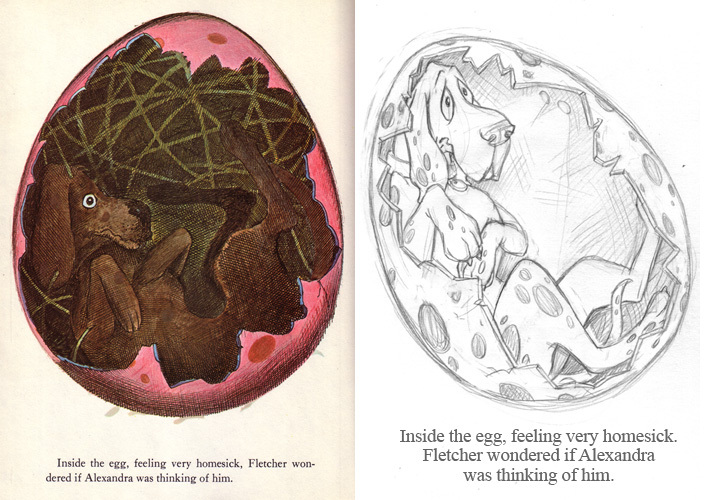 "Inside the egg, feeling very homesick, Fletcher wondered if Alexandra was thinking of him." What’s funny is that while I was drawing this, I began to experience muscle memories. I began to remember that, as a little girl, I had tried redrawing this page already! So, yeah… Really liking this! I’m going to finish this one tomorrow! This entry was posted on Thursday, July 28th, 2011 at 7:52 AM	and is filed under Journal. You can follow any responses to this entry through the RSS 2.0 feed. You can leave a response, or trackback from your own site.